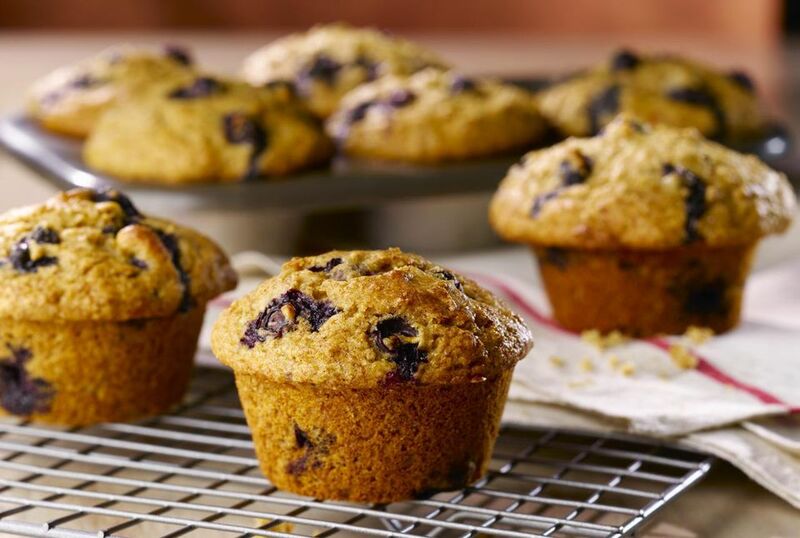 Warm, fresh blueberry muffins are hard to beat. They are perfect in so many ways. Blueberry muffins are a great grab-and-go breakfast, a treat to be enjoyed during brunch, or really a tasty bite any time of day. If you are watching your waistline or prefer to cook low-fat recipes, this one is a great go to. The fat of traditional recipes is cut by using a small amount of heart-healthy canola oil instead of butter or margarine and fat-free milk is used instead of whole or 2% milk. Those simple swaps make these blueberry muffins a win-win situation. There are a few easy ways to alter this recipe, without changing the fat content of anything. You could swap out the milk for low-fat buttermilk. It would work just as well and provide a slight tang to the muffin's taste. You can use fresh or frozen blueberries. If you do use frozen blueberries, defrost them first. Strain the defrosted blueberries in a colander as they likely produced a lot of juice. You don't want all this juice in your muffin mixture. The juice will color the batter blue and will make it too liquidy. If you want a slight citrus hint, add in some lemon zest to the muffin batter. If you prefer mini muffins, follow the recipe and use a mini muffin tin. The smaller sized muffins will need to bake for less time, so check them at around 15 minutes. Muffins can be stored on a plate on the countertop for a day or two. If they don't disappear by then, store them in a sealed container in the refrigerator. Muffins can also be frozen for a quick breakfast. Store them in a zip top bag. To defrost, either leave on the counter or in the refrigerator overnight or warm them in the microwave for about 1 minute (times may vary depending on microwave strength). Heat the oven to 400 F. Coat a nonstick 12-cup muffin pan with cooking spray or line with paper cups. In a separate small bowl, combine milk, canola oil, egg, and the vanilla extract. Make a well in the center of the dry ingredients and add the milk-oil-egg mixture. Stir until all the ingredients are combined and the mixture is just moist. Fill muffin cups 2/3 full and bake for 18 to 20 minutes, until the muffins are golden and a toothpick inserted into the muffins comes out clean. Cool the muffins on a wire rack.